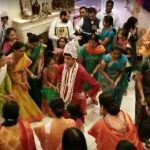 For 7 straight days, 2 hours at a time, Ramuji gave the city of Houston a taste of Srimad Bhagavatam that is sure to stick to the listeners’ minds and hearts for a long time. He mentioned that the 14 hours was just too little to even scratch the surface of the Purana. 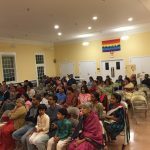 There is no doubt that it left the devotees wanting to hear more and more of Bhagavan’s story. The mahatmyam, the different avataras of Vishnu, the story of Parikshit, story of Jadabharata, the charithras of Dhruva, Ambarisha, Prahalada, & Ajamila, Gajendra Moksha, Krishna/Balarama katha, and many other smaller stories, all contributed to 7 blissful days that culminated on the opening weekend of the Navarathri festival. 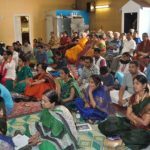 All the devotees were impressed with Ramuji’s depth of knowledge and ability to articulate with lucidity. A few of them were eager to invite Ramuji to their residence for a home ssatsang. On one such occasion, Ramuji talked about the glories of Thirupavai. 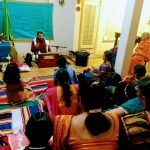 In the residence of Mr. Narayan Dave, the devotees gather every week for satsang and Namakirtan.